The human race, when viewed over the last few hundred years, is moving away from the inflammatory diseases associated with high fevers toward the more cold illnesses, such as diabetes, cancer, and fibromyalgia. Today the average person will commonly run a “normal” body temperature between 95-97° F. Ideally children and adults should maintain a core temperature of 98.6° F or slightly higher. Incao, P. Lilipoh, Issue 24, 2001 It is interesting to see how what experts consider to be “normal” is changing every year as our population becomes sicker and sicker. I purchased a thermometer recently that listed the normal temperature range as 95.9 to 99.5° F. This company considers a temperature that is almost 3 degrees colder than the optimum 98.5 to be normal, when as will be discussed later a temperature this low should not be considered normal and is actually detrimental. Fevers on the other hand are a very important mechanism in the developmental processes of growing children. Not only does the fever help destroy the microbes, but it trains the body to regulate the warmth organization of the body in adult life. Fevers in childhood also help to establish a stronger constitution. Most people never check their temperature unless they feel like they have a fever. If their body temperature is low to start with then a rise in temperature of 3 to 4 degrees will often only bring them up to what is the standard normal temperature…98.6°, which frustrates them since they know that they feel feverish. The ability to even produce a fever is decreasing in today’s society. Many people diagnosed with cancer state that they were always the healthiest ones at work, and never had a sick day. Some of them have told me that they have never vomited or run a fever in their entire life. These people are nonreactors. This is very bad! Very dangerous! When the body temperature is consistently low, the body becomes increasingly non-reactive or over-reactive to its environment. Their bodies do not react correctly to the challenges of various microbes, environmental toxins, and the ever increasing challenges from electromagnetic pollution from cellphones, laptops, and gaming devices. The warmth organization should have been established through the understanding what the wisdom of the body is striving to accomplish in childhood fevers, and by using treatments that work in tandem with what the body needs to progress naturally through the infection. As it is, doctors have put fear in parents and encouraged the over-use of antipyretic medicines (anti-fever medicines, such as Tylenol), immunizations, and antibiotics. Several generations in families now have been treated with drugs exclusively in the effort to “free us from suffering”, the end result… generational drug-induced over-cooling and non-reactivity of the human race. I tell my patients often, if a lion comes up and bites you…you should bleed. If a potentially disease causing microbe is growing unchecked in your body…your body should react and produce the appropriate fever and immune responses. The sickest people are those whose body does not react to the challenges of their environment. We now know that in an essentially healthy child, as reported in the Journal of the American Medical Association (JAMA) that the use of antibiotics for most common bacterial infections is not necessary. Historically medical doctors would prescribe an antibiotic for 7-10 days for common childhood infections. JAMA now reports that it is likely the antibiotics were doing more potential harm than good, and even if the child received no antibiotics, the illness was beaten by the body's immune defenses in the same amount of time, 7-10 days. Children, by God’s design, must experience fevers. It is a necessity! Fevers in children train and enable the fully matured and healthy adult body to keep microbes from growing unchecked. Remember from our previous discussion of microbes, that no microbe can replicate at will, or unchecked in a healthy body. Healthy adults, those whose family for generations, were raised with no suppressive treatments, and therefore have a strong heritage, should never experience prolonged infectious disease. These people, if all other aspects of life are balanced, should live incredibly long, illness-free lives. Ideally, the fevers that are training a child’s body should not be needed in adults. The training of the body during childhood to control the overgrowth of microbes should negate the need for high fevers in the adult. The natural and normal need for fevers in childhood for developmental purposes is not present in an adult. Adults experiencing high fevers should be observed closely to determine the origin of the fever, the significance of which can be much more serious. If an adult becomes sick from a microbe then we can assume that somewhere along the line their body was not allowed to develop correctly, or they have become out-of-balance in some area of life. In the former case, it is better late than never to support the fever in its belated efforts to learn balance. In the later, efforts should be made to identify what area of life caused the imbalance, correct it, and assist the body in restoring healthy function and balance. These days, doctors are challenged with people presenting with a combination of the above, requiring the re-education of the person on several levels. While it is true that if we all lived a wonderfully balanced life, no microbe could get enough of a foothold to cause disease, not many people live this way. As a result, we pay the consequences, and microbes do get a foothold. Therapeutic efforts should then be made to restore and/or retrain the body to maintain balance. Treatments such as antibiotic and anti-fever medicines will only further damage the body’s ability and desire to learn from the event. The suppression of the fever through medicines, baths or enemas does not indicate improvement in the underlying illness. Without the fever to assist the healing process, the illness continues down a different path of disturbance likely creating a more severe or chronic illness. A more ideal treatment protocol works to support the efforts of your body…of which the production of a fever is just one aspect, the rest being specific immune system factors, as well as frequencies and energies generated by the body to kill and bring balance to imbalanced tissues and bring under control the invading microbes. The energetic healing ability of the body can be seen in many different ways… the correction of infectious symptoms by a chiropractic adjustment, meridian therapy, homeopathic resonance medicines, and the restoration of balance in stress induced infections, just to name a few. Each of these treatment methods is working to support and strengthen the frequencies that the body is already generating to restore balance. Many parents become unduly fearful when their child develops a fever. Keep in mind that the fever is not an illness but a strong healing tool of the body. It is an ally in raising and developing your child into a well balance adult. The following will help dispel much of this fear, by teaching how to recognize the various stages of fever and thereby what should be done to support the body through these stages. The body produces fever in the initial stages of illness and should be supported and even promoted at times. The illness is not over with the disappearance of the fever. After the full benefit of the fever has been achieved the body will need other treatments unique to the type of illness which may need to be continued from days to weeks. The earliest signs of illness in children can be seen in a change in their mood and energy level. They may become increasingly sensitive and may appear moody, irritable and tired. Their appetite slacks off, the throat may be sore, glands in the neck swollen, and their temperature is slightly elevated, which is a sure sign that their body needs to work through something. At these first tell-tale signs it is wise to plan ahead and make sure you set aside the time and materials to help your child through their upcoming event. I remind you that viruses and bacteria are not the enemy in childhood illnesses; they are merely the architectural instrument needed to construct a better, stronger child. So do not worry about having medicines for “killing” the viruses and bacteria. All of the following recommendations are designed to support the body’s own self-regulation. God designed the body to go through this process of training. The goal of treatment is to help direct the degree and duration so that it is not too great or too little. Homeopathic remedies are the best form of medicine to help a child through a fever. They are safe, nontoxic, and have over two hundred years of substantiation and research. As you will see in the upcoming fever guide, the various low potency homeopathic remedies can be safely and confidently used in the home without consulting a physician. No other form of medicine can achieve the degree of benefit in a childhood fever. It is important to never suppress the fever, but to work with the efforts of the body. 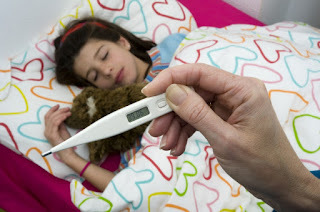 Children look and feel miserable many times when in the midst of a fever. Assure them (and yourself) that all is well and that their body is growing stronger and more mature as a result of the fever. When dealing with a gradually increasing fever, as opposed to a rapid and sudden onset high fever, it usually indicates bacteria associated inflammation. In that it is bacterial the initial supporting measures will be different than for viral infections. • If the fever continues to progress beyond 102.5° F, then homeopathic silver 30x (Argentum) should be used to restrain the excessive fever process. Use 6-10 drops or pellets every fifteen minutes until fever breaks or stops rising. Although fevers much higher that this present no great danger in children they generally indicate that the organizational and restructuring efforts of the body are somewhat in need of greater control of the situation. Remember, an excessively high fever, such as 103.5° F or greater, does not mean that the bacterial infection is correspondingly bad, nor does it mean the infection is getting worse. The excessive fever indicates that the temperature regulating aspects of the body are set too high. (Homeopathic silver is not the same as colloidal silver, the latter will not achieve the same results, nor is the homeopathic silver being used to “kill” bacteria in this situation.) In this excessive fever condition, measures to assist in bringing down the body temperature can be used. Room temperature lemon juice and water compresses on the abdomen and calves, as well as tepid water enemas can help to disperse excessive heat. • If the child’s fever is only weakly manifested, around 99.0° to 100.5° F then one should support and strengthen the body’s efforts, yes actually promote a stronger fever response, so that the goal of the inflammation is reached. Support the weak fever by using 6-10 drops or pellets of homeopathic Sulphur 6x or hepar sulphuris 6x at the same time as adding external warmth through warm baths (no warmer than 100° F). Insure that the sick room is warm. It can be comforting and warming to the spirit to have the room lit with candlelight. Rub the body with Peat-based oils, such as, Solum Uliginosum oil (Wala/Raphael) and wrap the child warmly in peat/wool blend bedding. • When the fever breaks and begins to fall it is time to support the formative forces working with the purpose of the rebuilding and restructuring of the child. It is at this stage that the heat of the fever will be felt in the arms and legs and the child may break out in perspiration as the heat is no longer needed and the body is attempting to vent it in the extremities. Lemon-water compresses can be used on the abdomen and calves to help the cooling process. Herbal extract of Echinacea augustafolia along with homeopathic Quartz 3x are beneficial for supporting the formative process well beyond the end of the illness event. Refer to specific illness protocols for how to proceed after the fever breaks. • Remember the fever is just the first stage of the body dealing with the problem. The frequency-matched botanical formulas Microbojen™ and Virogen™ are specifically designed to match and support the energy the body is already generating to resolve virtually any bacteria attack. When dealing with a sudden onset rapidly increasing fever, as opposed to a gradual onset fever, it usually indicates virus associated inflammation. In that it is likely viral the initial supporting measures will be different than for bacterial infections. • Viruses can cause a sudden and rapidly rising fever and no remedy is more indicated than homeopathic Aconite napellus. The optimum dosage is Aconite 6c to 30c potency, 6 to 10 drops every 15-30 minutes increasing time between doses as fever begins to slow its incline. Aconite has strong anti-viral actions, but is used all the way to the breaking of the fever. Aconite puts a restraining action on the rapidly progressing fever process of the body. Remember viruses do not replicate well in a hot body, so once again the point of this remedy is not to bring the fever down but to harness the fever and drive its attack. Be patient; do not use anti-viral medicines until the fever begins to fall. We want the body to achieve the degree of fever it needs and trust its wisdom. • If the fever continues to progress beyond 102.5° F, then homeopathic silver 30x (Argentum) should be used to restrain the excessive fever process. Although fevers much higher that this present no great danger in children they generally indicate that the organizational and restructuring efforts of the body are somewhat in need of greater control of the situation. (Homeopathic silver (argentum) is not the same as colloidal silver, the later will not achieve the same results, nor is the homeopathic silver being used to “kill” viruses in this situation.) In this excessive fever condition, measures to assist in bringing down the body temperature can be used. Lemon-water compresses on the abdomen and calves, as well as tepid water enemas to disperse excessive heat. • When the fever breaks and begins to fall discontinue the homeopathic aconite. It is time to support the formative forces working with the purpose of the rebuilding and restructuring of the child. It is at this stage that the heat of the fever will be felt in the arms and legs and the child will break out in perspiration as the heat is no longer needed and the body is attempting to vent it in the extremities. Lemon-water compresses can be used on the abdomen and calves to help the cooling process. Herbal extract of Echinacea augustafolia along with homeopathic Quartz 3x are beneficial for supporting the formative process well beyond the end of the illness event. • Remember the fever is just the first stage of the body dealing with the problem. The frequency-matched botanical formulas Microbojen™ and Virogen™ are specifically designed to match and support the energy the body is already generating to resolve virtually any viral attack. The possibility of a convulsion is remote and is not necessarily due to an excessively high temperature. The convulsion might manifest as shaking of the whole body, biting the tongue, wild, rolling eyes, and may even include loss of consciousness. Dr. Otto Wolf, M.D. says it best in his book “Home Remedies”, “In rare instances there can be febrile convulsions. While this looks dramatic, in most cases they have passed by the time medical help has been sought. Such convulsions can happen during the time of the increase of the fever, but not at the time of its maximum. For this reason anti-fever drugs are inappropriate. However, if the convulsions last for longer periods, or are repeated, the doctor should be consulted.” Wolf, O. Home Remedies, Herbal and homeopathic treatment for use at home. Antroposophical Press 1991. Emphasis added.